This Is Your Captain Speaking: Airliner With Only Three Minutes of Fuel Told It Can't Land! Airliner With Only Three Minutes of Fuel Told It Can't Land! A breathlessly told story in the Daily Mail screamed the above headline to tell of an airliner nearly running out of fuel while being told tough beans by the controller. It's dramatic and scary and also has the added benefit of having very little in common with reality. (More on that later). The one thing it does do, and probably quite well, is to gather clicks. And that means eyeballs and ad revenue. So I naturally chose the same title for this post while also calling them out. You might think that most people involved with aviation would have an interest in demystifying the subject to help calm the nerves of the flying public. That of course could not be further from the truth, with the above mentioned story as prima facie evidence. We pilots, I must admit, also like to be associated with a frisson of danger and a whiff of derring-do. It assuages our fragile egos and also doesn't hurt during contract negotiations, but we certainly don't go out of our way to scare folks. Your 'umble narrator has even been accused of spreading discomfort towards flying though this blog. (Thanks, Mom!) (jk) My aim in writing about flying is to merely throw open the hood to explain some of the workings not seen by the public and to thereby hopefully soothe the savage flying beast. As with any human endeavour, there is perhaps some inevitable sausage making going on in aviation that reluctant flyers may not care to see. But rest assured dear reader, commercial aviation is an extremely safe and robust mode of travel. If my scribblings convey the opposite, I apologize. Though the topic has been covered ad infinitum to ad nauseum, flying in a commercial airliner is probably second only to travelling in an elevator in terms of safety. And of course we all climb willingly into our automobiles which kill tens of thousands annually, but at least we're in control! Quoting safety statistics, though, seems to have little effect on the visceral fear felt by some. John Madden, the NFL broadcaster, famously refused to fly and instead rode his bus all over the country to call games. For those without million dollar contracts and custom buses who still need to travel, there are plenty of programs aimed at helping scared flyers. (Programs, by the way, which probably provide a decent paycheck for the proprietors). And though most pilots are gracious and understanding when fearful customers stop by to say hello (as they're encouraged to do), I am personally perplexed as to how allegedly functioning adults can allow their feelings to gain such purchase so as to refute overwhelming statistical evidence to the contrary regarding airline safety. That one I leave to the shrinks. Ok, as promised, back to the story. An Allegiant MD-80 was delayed for about an hour before departing Vegas for Fargo, ND. The delay put the aircraft in conflict with a Blue Angels practice which had been previously scheduled. 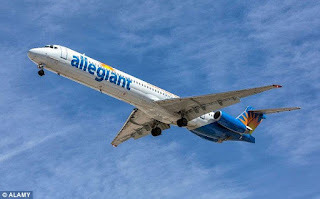 Being a clear day, the Allegiant plane probably had only it's required reserve fuel on board which contrary to the article was not 3 minutes but rather 45. The term bingo is used to denote a decision point. In this context the pilot meant that he had three minutes of loiter time before diverting, not running out of fuel. Of course the tower would absolutely let the plane land for a declared fuel emergency. That's a legal definition. Declaring an emergency will always get an aircraft priority. The controller simply needed to hear that declaration before interrupting a scheduled event. Who screwed up here? The pilot for being unaware of the field closure which would have been listed in the "notices to airmen" or "Notams" which every pilot is required to reference before departure. The morons who write these stories as clickbait may (but probably don't) know better, but writing what really happened would spoil a great headline.